The first part of the sales funnel for Robert Kirby International's personal development program, Being Different Changes The World, involved sending 3 e-mails in as many weeks to a house list. Here's the client-edited version of E-Mail 2. Please also see E-Mail 1 and E-Mail 3. Subject: [Recipient's First Name], which one of these 2 personality types are you? E-Mail Headline: Is Your Life Aligned with the Creative Force? Body: Which type of person are you? In my experience, people can be divided into two groups. Let's call them the 1. Survivalists, and the 2. Experientialists. Survivalists typically consider themselves to be the alpha dogs in what they think is a dog-eat-dog world. They operate in survival mode virtually 24/7/365. Stress, exhaustion, overwhelm, “vigilance” . . . are but the price to pay for “success”. What only a few of these people realise is that they are most likely chasing after their own tails . . . preoccupied with keeping up with the Joneses . . . fodder for the rat race . . . and frankly unclear about where life is taking them. The experientialists, on the other hand, savour the present—they are neither preoccupied with the past nor obsessed about the future. They experience, look for and absorb the lessons, and grow forward. The brain-wave activity of an experientialist differs from that of a survivalist. No surprises there. The experientialist's coherent brain-wave activity indicates not only balance, but also stability and harmony. To align your life with the creative force that exists in and around each of us, you must first deal with the false thoughts and emotions that originate in the unconscious mind. 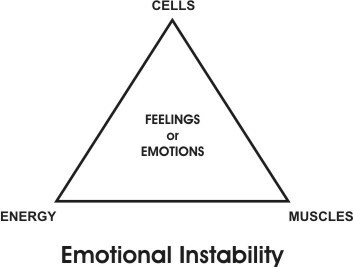 Let's focus on emotional instability for the moment because it is pretty complicated. Emotional instability involves not only emotions, but also your energy, cells and muscles. Your life energy is shaped by your past and present environments. Negative feelings such as shame, guilt and anger weaken your life energy. Conversely, positive feelings such as love, support and inspiration strengthen it. Each of the body's cells has a memory. Neurotransmitters (signaling chemicals) and neuropeptides (protein-like communication molecules) constantly transmit the status of the body's default emotional state. In other words, our future is literally defined by the emotions we choose to feel over and over again. Each of us will experience the fight-or-flight dilemma many times in our lifetime. Our response or reaction to a person, incident or challenge can trigger a muscular response, which is then “burned” into the subconscious mind. As you can see, our brain-wave activity is influenced by life energy, muscular response and cellular activity. In turn, these three areas are fuelled by our emotions. Book Your Seat Here for FREE event “Unlock Your Brain Power” – Places limited and time is running out! Here's the original version of E-Mail 2.